Chennai: Vijay TV is pushing hard to bring in fresh content into Tamil television industry. 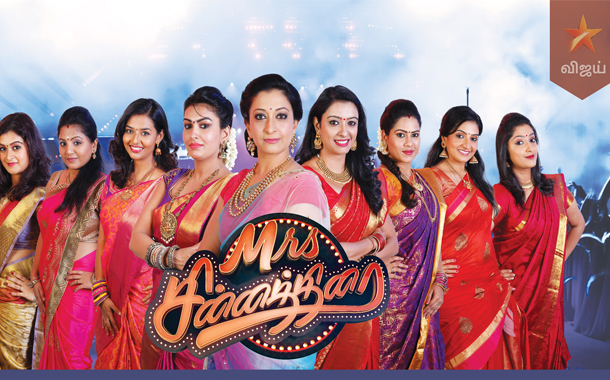 One such new show will be Mrs. Chinnathirai, a one of its kind beauty pageant that feature married female celebrities of the Tamil television industry. What’s new about the show? While television celebrities justifying various characters offered to them on screen. Sometimes, these divas may be totally contrast to what they are on screen. According to the story, they might be from a Rural background, but in reality, they will be ultra-modern girl. Through this show, the real talents and skills of the small screen female celebrities will be explored and theeternal and external strength of the contestants will be put before the public viewing. The show will have 9 different rounds including the grand Finale. Each round will have a different theme and a different venue. That one celebrity who is super talented with multi-tasking capabilities will win the Title Mrs. Chinnathirai. The celebrities who are going to compete for the title are Actress Nisha Ganesh, Actress Sindhu Shyam of pagal nilavu fame, Actress Sujitha, Actress Monica, Actress Vandhana, RJ Sindhu of Kings of comedy juniors fame, Actress Anu Vignesh, Actress Sri Vidhya, Actress Vanitha Hariharan of kalyanam Mudhal kadhal varai fame and Actress Sri durga. The show is all set to commence from September 24th 2017, every Sunday at 7 pm. The winner of the show will be crowned as Mrs. Chinnathirai 2017. To more about your celebrities, don’t miss to watch the show every week.